Advertising series in half-round works, consisted of 24 pedestrians of 45mm and 10 riders. Seven marks are going to use these figures (at least the pedestrians): Cafés Martel, RD, "L' Idéal", Familistère, the "Café Corsaire" J.A (wines and coffee) and in ......... "Le Comptoir Français". 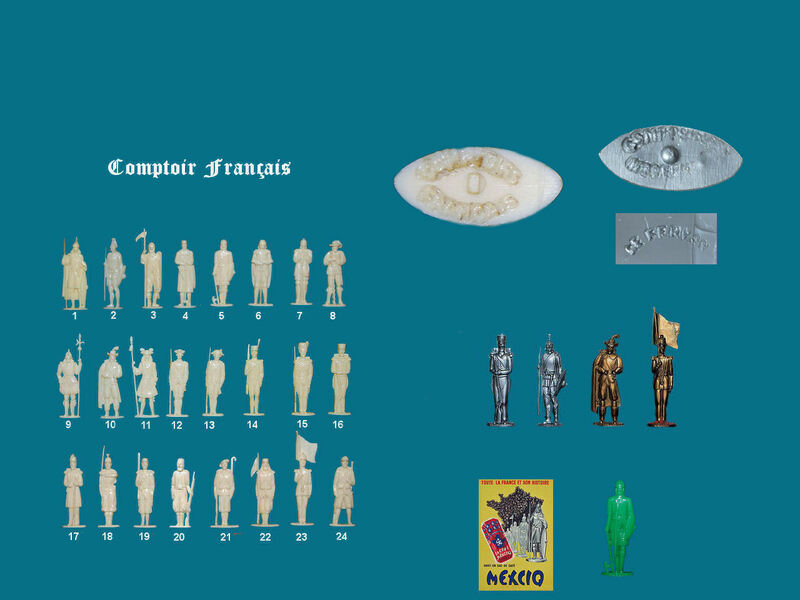 Were found by a very attentive collector, identical white figurines, engraved under heat " Comptoirs Français " this time S is present. It is sure thus from now on that it is good this brand which distributed them. 10 riders exist in the same colors. Numerous figures without brand were taken back by diverse small firms. If we believe the poster, it is possible to attribute at least the unmarked grey versions to the "Café Mexciq".